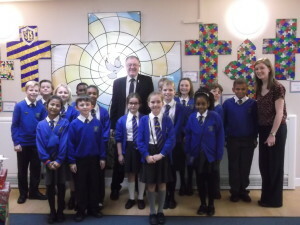 Last week (16th– 22nd November) was Parliament Week, and to mark this year’s event in our area on, I visited a local school in my constituency, St Laurence Church Junior School, to speak at the school assembly. After taking a Question session from the school councillors, I set a task, arranged by local teacher, Ms Allen, for all the classes to help me come up with solutions on healthy eating and road safety outside of their school. Last Friday, I returned to school to hear their ideas and vote with them to decide the best ideas. I was impressed with both the quality of the presentations and the ideas they had come up with. Many of them also demonstrated a knowledge and appreciation of my role and what my job involved. Parliament Week’s narrative this year was all about promoting a #DoDemocracy, and encouraging everyone to remember as citizens we can play a role. My school visits were a great opportunity to get the children thinking about how they can be active and play a role in the community. This is crucial first step for people to feel involved and to see politics as the vehicle for change. We are all tremendously fortunate to live in a democracy with liberal values, and Parliament Week is fantastic way to celebrate this and remember if we all play a role we can make it even better. Thank you to the school and Ms Allen for helping to arrange the exercise. In addition to my school visit, I recently wrote to school’s to remind them of the great opportunities available to them for visiting Parliament and the newly built Education Centre on site. In the last year 9 schools have visited Parliament. But what many people don’t realise is that Parliament is open to everyone and I welcome all constituents to get in touch with me if they would like help with visiting Parliament and arranging a guided tour – I would certainly recommend it. There are still a number of events taking place in the next couple of days and I would encourage people to have a look at the website to see if there are any events nearby that you could attend.